Letters, contracts, invoices, receipts, bills, handwritten correspondence, photos, business cards. Scan anything, wherever you are! 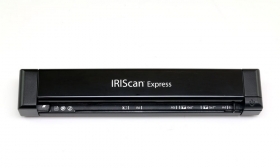 IRIScan Express 4 is a powerful combination of a fully portable color scanner and breakthrough OCR software. It simplifies all your retyping needs, whether at home, on the road or in the office. Compact, lightweight and USB powered, it is designed to be carried around and fits into any purse, backpack or laptop case. Smart buttons for smart tasks! Don't waste your time with scanning software anymore, simply push the button to launch your scanning! IRIScan Express 4 features a smart customizable button to automate frequent scanning jobs. Simply configure the button using the provided software and your documents will be processed the way you want at the push of a button, literally!. IRIScan Express 4 makes it very easy to export your scanned documents to your favorite Cloud hosting service. Either you configure the smart button to send your output files in a Cloud hosting application installed on your computer (Like Evernote or Dropbox) or export your files to Readiris to make them searchable or compress them before uploading to the Cloud (using Readiris Cloud connectors). - Scan Plastic cards Should you need to scan ID Cards, credit cards for customer file creation, the IRISCan Express 4 will ease your daily way perfectly. - Scan your pharmaceutical papers and doctors prescription Should you need to scan your customer doctors prescription, IRISCan Express 4 will be the best and easiest tools ever. - Scan your truck shipping notes Reduce the time you get paid your invoices by your customers. - Scan Banking and Insurance slip Get organized, and manage your daily correspondence with your bank and insurance.